With Blaine out of the way, only one more Gym remains. That's the one in Viridian City that has been locked up until this point. Inside waits your nemesis, Giovanni. His protegé trainers are no slouches, and seemingly easy paths around them are complicated by the special tiles that bounce you around like a pinball. Bring plenty of Potions and head back to the Poké Center if you take too much damage. And keep your eye out for a free Revive inside the gym. After his defeat in Saffron City, Giovanni returned to his old job as the leader of the Viridian City Gym. Now that he's given up on crime, he'll gladly reward you — if you beat him in battle that is! The hardest trainer yet? Not likely, since the same Water-type Pokémon that you trained to defeat Blaine can walk all over Giovanni's Ground-types. Plus, every one of the starters (Charmander only counts if it's a Charizard) can easily K.O Giovanni's pokémon. In Blue and Red, a single Gyarados, Vaporeon, or other high-30s level Water-type Pokémon can take everything Giovanni throws at you just by using Surf over and over again. If you managed to catch Articuno, its Ice Beam attack is a super-effective one-hit K.O. against everything in the Gym, including Giovanni's L50 Rhydon. 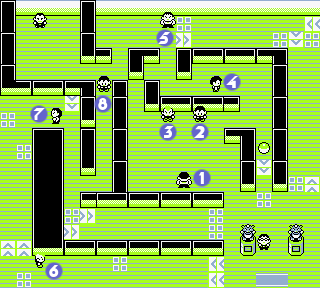 Things are a bit trickier in Yellow, with higher-level opponents and a Normal-type Persian tossed in to trip you up. Still, stick with Water for the other four and you'll do fine. But careful when sending out a water-type against Giovanni's Nidoqueen and Nidoking because they know Thunder. Therefore it is recommended to bring a psychic-type like Alakazam or your own ground-type like Dugtrio. Nidoqueen and Nidoking's poison-type characteristics make them vulnerable to psychic and ground-type attacks. Your prize is the final badge, the Earth Badge, and TM 27 (Fissure, a Ground version of the inaccurate, one-hit K.O. Guillotine attack). The Earth Badge ensures that Pokémon of any level will obey you. This page was last edited on 8 April 2016, at 16:57. This page has been accessed 583,275 times.